Since the beginning of his career in the 1990s, and besides his pet ants, Blazy has always worked with organic matter (plants, food) and, more importantly, their transformative quality. This condition may have been too often mistaken for or quickly reduced to the natural process of decaying – for his art, despite Blazy’s protests, is commonly received as an ode to the ephemeral and the perishable. This, though, ignores the fact that mould is a growth and life is a cycle. The artist’s show Débordement domestique (meaning ‘domestic overrun’) clearly denounces this habitual misreading by proclaiming perenniality as the true essence of all mutations, adopting a brand-new viewpoint that uses some unexpectedly 100%-artificial and nonbiodegradable counterpoints to Blazy’s vast artistic compost. The domestic surplus, or deluge, starts at the gallery entrance with a familiar smell of junk food coming from lifelike, yet excessively oversized, plastic replicas of pizza and lasagne, three hanging on the walls and one installed on the floor. Marguerite, Lasagne al forno, Surprise blanche, and Suprême Cheese are all made from polystyrene, food-colouring substance and a homemade mixture of wallpaper adhesive with artificial flavouring (‘cheese pizza’, suitably enough). Once a week for the entire duration of the show, Blazy comes to the gallery and layers more adhesive onto these near-eternal reproductions of leftovers in order to, if you will, ‘re-activate’ their aroma. As with a plant that has to be watered, the idea behind the fake food is to create an object that needs to be taken care of. In doing so, the weekly ritual of the artist feeding and therefore modifying the artificial works is what brings them to (the process of) life. Speaking of which, another still life, Fontaine, arouses itself on a cyclic basis during the show following the artist’s instructions. 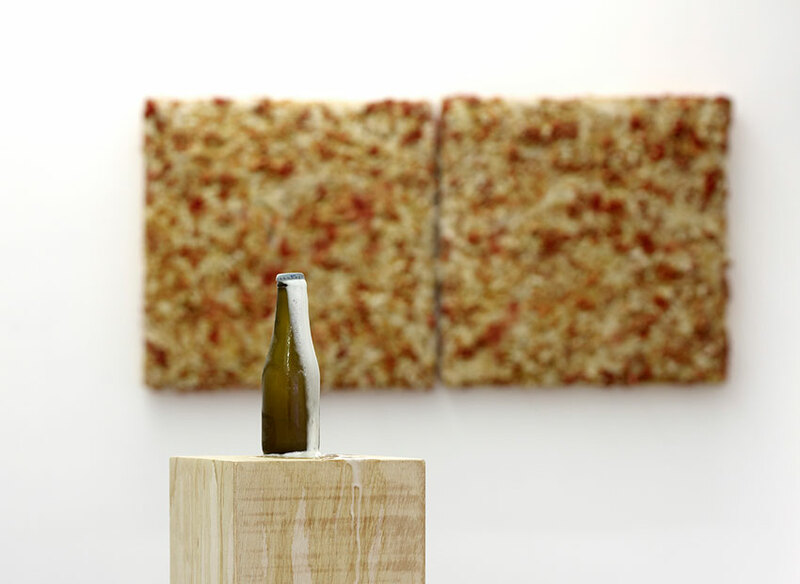 Every day at 6pm sharp, a member of the staff opens a glass bottle of beer, which spent the two previous hours in the gallery’s freezer, and leaves it on a wooden pedestal in the middle of the exhibition space for all to see. The freezing causes the cold foam to gush out of the bottle and run down the wood. While this cycle is actually meant to respond to and re-enact in the gallery a domestic and personal habit of the artist in his studio (drinking beer once a day after work), you may concede that it sexually and ostensibly, yet opportunely, closes the loop of this review and the ritual of reproduction.